UPDATE: Contest tweet going out at 2 p.m. (Central) on Tuesday, Sept. 2. Follow me now! Think you’re ready to step your fantasy football game up to the next level? Want to try to best the Fools in a friendly fantasy football competition? Do you REALLY think you’re smarter than a fifth grader? Well, I made it past the fifth grade on the second try, pal. Get ready for a challenge! If you’ve mastered the art of playing for free and playing with your fantasy football buddies, you’re bound to be looking for a greater competition. Short of wrestling a bear out in the wilderness — exhilarating, I’m telling you — you’re only going to get your knuckles white again by putting a little more on the line than your anonymous Internet pride. You won’t lose any fingers, but the prizes can be insanely huge — like move out of Mom’s basement huge. Pay the Fan is a new contender in the fantasy football marketplace. Started in 2007, it doesn’t break the bank, and for less the cost of your quarter-pounder meal each week, you could compete for $10,000 and a grand prize of $250,000 for the season. Unlike your typical fantasy football league, you don’t draft your players prior to the season. You pick your lineup from a pool of players each week, but that is where it gets tricky. You can only use each player twice, so you want to match them up when they are going to have their best game of the season. For the record, you probably won’t be able to just start every player the week they face Atlanta or Detroit, but that wouldn’t be a bad strategy. I’m a fan of their clean interface which makes it super easy to add and drop players, and you can even set your rosters far in advance of the games for each week if you are some kind of busy investment banker or have a real job. Each week, the highest scoring team is awarded $10,000, and the person who racks up the most points at the end of the season takes home the grand prize. 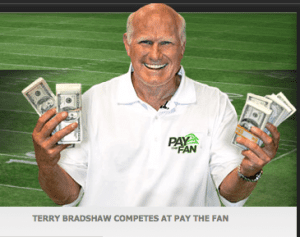 As if the prizes and ease of setting rosters wasn’t enough, Terry Bradshaw plays there. I hope if you win, they sell a t-shirt that says ‘I Beat Terry Bradshaw.’ I would wear it proudly. Fantasy Football Fools is working with Pay the Fan this season to see which one of the foolish followers knows their fantasy football the best. We’ve set up a league at PaytheFan.com where you can face off and smack talk me and your fellow foolish readers, and in addition to the weekly and season-long prize that Pay the Fan gives out, the winner of our league will receive a $500 Best Buy Gift Card. That’s like a ticket to HDTV and 5.1 sound heaven. On Tuesday, September 2, I’ll be hosting a contest through my Twitter account (@jacobsloan). I’ll ask a fantasy football question, and the first FIVE people to tweet me the correct answer will win a free football season membership at Pay the Fan. If you aren’t already following me on Twitter, it’s time to jump on board now. If you miss out on the contest, I’ll also be tweeting a discount code on Tuesday that will save you some money to sign up for an account, and even with all these discounts and extra prizes, you’ll still have the same chance of winning the $10,000 weekly prizes and $250,000 grand prize from Pay the Fan. Sound good to you? Well, get ready for a big weekend of college football, and make sure you follow me on Twitter. I’ll be spitting out more details about the contest all weekend with the big question announcement going Tuesday. If you aren’t going to be around a computer on Tuesday, make sure you enable Twitter on your mobile phone! Q&A QB is a new head-smacking, hard-hitting, name-taking question and answer series where Jacob assists readers and his Twitter followers in perfecting their draft strategy and winning their league. This post is the first run at it. Let Jacob know what you think in the comments, and if you’d like to be featured in a future Q&A QB post, send Jacob an email or tweet him, whatever that means. This week in Q&A QB, we’ll take a look at several questions and a walkthrough for how to draft with the first overall pick in a nine-team division. QUESTION: I have the first pick in the draft, and there are nine teams in a point-only division. What would your team look like? Basically, you luck out with LaDainian Tomlinson then load up on wide receivers that score a lot and a top quarterback. Once you have found your top players in each category, snag a productive second running back and another receiver. I suggest using this draft strategy: L.T., WR, WR, RB or QB, RB or QB, WR. Flesh out your roster from there. After taking L.T. in the first, hopefully you will still be able to pick two out of Marshawn Lynch, Reggie Wayne, Terrell Owens and Braylon Edwards for your second and third round back-to-back picks. Lynch is hard to pass up if he is there, but he is more a yardage guy than a touchdown machine. Of course, one can always hope for change. FOLLOW-UP QUESTION: I’m obviously going L.T. first, and since it’s a nine-team league, my next pick will be the 18th overall pick. With the second and third round back-to-back picks, I was thinking Braylon Edwards then, if available, one of the top-10 QBs. Hoping Romo will slip and fall that far, but I’m doubting it. So most likely it will be Drew Brees or Matt Hasselbeck. That way, I at least have a top tier in each position and fill in from there. On my next picks, I’m thinking players like Santonio Holmes will slip to me and maybe someone like LenDale White. What are your suggestions? I’d target Braylon Edwards if you can get him in the second round. If not, take one of the top-10 WRs if there is still one on the board. In your third round, I think you could go WR or QB. If Romo is still on the board, definitely take him. Brees is probably worth taking as well. If a top WR like Andre Johnson, Larry Fitzgerald or T.J. Houshmandzadeh is still on the board, I might pass on Brees and take another WR hoping that an elite QB will fall to you. I definitely would not use your third round pick on Hasselbeck. I’m avoiding him this season, and I don’t think he’s worth a high pick this year. His WRs are all banged up and the new RBBC could reduce Hasselbeck’s throwing attempts. In the fourth round, I would look at the QB situation and decide what you want to do. There may still be one or two elite QBs here. This pick is close to where Ben Roethlisberger is being taken, but I think it’s a little high for him. If you are worried you are going to miss out on all the top QBs, take one here with one of your picks in the fourth and fifth rounds. Otherwise, you could wait longer. You could push your luck and hope that Derek Anderson falls to you in the sixth round. I think he’s got about as good a chance as Big Ben of being a strong QB this year. With just nine teams, you’ll only be about 54 picks in by the sixth round and just across the 60 pick mark when your pick comes up. In standard scoring, that’s where Anderson, Hasselbeck (if you like him) and Jay Cutler are all going. You could take two of those guys back-to-back in the sixth and seventh rounds to have a strong QB tandem that could trade off every week. Note: This advice was given before Anderson’s concussion against the Giants, but I still think he can be counted on this season. It’s really up to you how you want to play the QB, but don’t reach for anyone. Brett Favre, Aaron Rodgers and Jake Delhomme also make good backup QBs that you can probably get in the eighth round with just nine teams. Just depends on how many teams are in need of a QB by the time the sixth round rolls around. Back to the fourth round, if you decide to pass on a QB there or have taken one already in the third round, you should look at Michael Turner, Edgerrin James, Thomas Jones or LenDale White here. All of them are 1) strong workhorse RBs that will get the majority of carries for their team and 2) not going to lose TD touches. Turner and Edge are both going to get plenty of carries as their young QBs develop. Jones will have the running lanes open because of Favre. White gets so many chances to run the ball that gravity forces him to produce. If any of them are available, spend a pick on them and then another WR like Plaxico Burress, Torry Holt, Roy Williams or maybe Brandon Marshall if you don’t mind his two- or three-game suspension. I like all of those guys better than Santonio Holmes. I have some concern that Big Ben is not going to throw the TDs as much this year, and when he does throw them, I think Holmes loses catches to Heath Miller and Hines Ward. From there on out, look for value picks that get a lot of touches and targets in their offense. Stick with guys that have huge upsides and little risk, and you should improve a lot this year. With a nine-man league, there will probably be plenty of waiver wire grabs to save your team by the middle of the season as well. Last weekend, I asked all my Twitter followers what players ranked in the top 50 they didn’t want to touch in their fantasy football drafts. So who does Twitter hate this season? Turns out they’re all running backs. Brian Westbrook is not a hard man to dislike in fantasy football, and I am not even talking about that time he stopped short of an easy touchdown against the Cowboys last season. No matter what he does, Westbrook’s never good enough to please fantasy football fans when the draft comes around. Last season, only eight players scored more fantasy points than Westbrook in standard, non-PPR scoring, and of those eight, only one of them was a running back. I am sure you have no idea who that running back was, so we’ll move on. The No. 1 reason that many people stay away from Westbrook is that he is “injury prone.” Westbrook went down late in the season in 2004 and 2005, and no fantasy player wants to forget it even though Westbrook has only missed one game each of the past two seasons. Missing the one game last year, Westbrook still scored 12 total touchdowns (7 TDs running, 5 TDs receiving) with more than 2000 yards rushing and receiving. Those numbers are pretty epic. He averaged more than 18 fantasy points per week in standard scoring and never scored less than 14–of course, overlooking the game he missed. You can hate the guy or avoid him if you want, but I like him this season because he’s proven he can stay healthy for at least 15 games, and with few weapons, the Eagles are going to use him a lot. He has the same workload concerns as LaDainian Tomlinson since he has had so many carries in recent years, but I don’t see anyone backing off of L.T. because of that, do you? I say you give Westbrook a chance this season. He’s a top five RB, no question, and I’d feel safe taking him before the Purple Jesus that is Adrian Peterson. L.J. is less of a puzzle than Westbrook. He is feared this season because he looked terrible last season. He missed most of training camp with his holdout in 2007 and, once he was paid, started slow against a tough early schedule. Owners held out until he got to the chewy center of his rushing opponents only to see Johnson injure his foot and get knocked out for the season. Not much has changed with L.J. He has a fully-functioning foot–or so I am told–but his offensive line is still going to be inexperienced. Don’t count on Brodie Croyle to step in and take pressure off the running game. The offense will look about as inadequate as it did last season. Best case, Johnson overcomes all and records a top five fantasy season, but with so many question marks, I understand why you all doubt him. I don’t see it happening. Stay away from him in the first round, but if you see him floating by in the middle or end of the second round, he could be worth a shot. Brown’s also a pretty easy one to figure out since he is also coming off injury. While Ronnie Brown was just starting to look like the new L.T., his knee injury in Week 7 stole him away from fantasy owners. While he was out, Cam Cameron left town and in came Bill Parcells. The new coaches like Brown as their starter, but they have enough confidence in Ricky Williams to let him carry the load while Brown eases back into things. A plus for both RBs is the addition of Jake Long on the offensive line. You can’t expect a lot of Brown until later in the season. If only someone would tell that to every other owner in your league, you could draft him at his real value. As the prodigal son of 2007 fantasy football, too many hype-drinkers are jumping on him early. Brown currently carries a late third round price tag on average, and that is reasonable if you can get it. I like him more in the fourth round, but frankly, I have to agree that I would rather avoid him. A better option if you want a piece of the Miami running schedule (easy as pie according to strength of schedule) is Ricky Williams in the later rounds. He’ll face some easy opponents in the first weeks of the season. So you think he is a one-year wonder? You probably pin half his performance on the respect defenses gave to Favre’s big arm, or maybe you just like Brandon Jackson to emerge this year. Well, whatever you think, don’t be so worried. Now that he has signed his contract extension, Grant should be the starter for Green Bay, a team that is more oriented toward solid defense this season and starting a first-year quarterback. That formula equals a commitment to the running game and plenty of opportunities for Grant. If you put faith in strength of schedule, Grant ends the season on a hot streak (see: fantasy playoffs). He may not put up the numbers he did at the end of last season, but the Seattle playoff game proved that he can struggle through adversity and come out on top. He’s a top ten talent you can get outside of the first round. Why would you pass that up? Selvin Young doesn’t have a bad name for himself. Unfortunately, his team does. When it comes to RBs, Denver is a crapshoot. Shanahan gets a kick out of torturing fantasy fans. He’s admitted that under oath. The man just makes no allegiances when it comes to the running game. Still, Selvin Young is the man to start the year. Rookie Ryan Torain is now out 6-8 weeks with an elbow injury, so he is no longer a challenge. It looks like a committee might form from Young, Andre Hall and Michael Pittman, but Young should see the bulk of the open field work. Being drafted at 65th overall, Young’s not too expensive, but I’ve seen him going earlier than the sixth round in many mocks. If you can get him fifth round or later after all the sure thing RBs are off the board, he could potentially be a starter for your fantasy team. Denver’s rushing opponents don’t give me anything to get excited about and doubt surrounds the Broncos offense, but they should improve this year with Cutler maturing under center and managing the diabetes that weakened him at the end of last season. Young’s in a committee, possibly an injury risk and in Denver. I leave it up to you whether you want to avoid him, but make sure you get him at a good price. Now that we’ve talked these guys over, I open it up to you non-Twitterers…what players are you willing to avoid this year? Explain why in the comments for bonus points. If you’re not on Twitter, get with the program and start following my updates (@jacobsloan)! Twitter is one of the easiest ways for us to harass each other about our fantasy teams during NFL games no matter where your opponent may be hiding…curled in a corner…crying under a pillow…or just screaming “WHY WESTBROOK? WHY!?!? !” into the sky. If you don’t know what it is, check out this video for a simple explanation. Try it out even if you don’t “get” it. You’ll come along eventually and be talking fantasy football with me in no time. Go sign up now and follow me (@jacobsloan) to talk fantasy football and possibly be included in a future article just like this one. Thanks to @timdnew, @bbille, @timothompson and @dreamented for their input on this post. Thank you for this moment of your time. PSA out. If you followed along with my recent expert draft, you saw me pass on taking a lot of depth at running back (RB) in the early rounds. Only in the later rounds did I really flesh out the RB position on my team. Taking Tom Brady in the first round certainly didn’t help me snag several elite RBs, but he fell to me at the 10 spot. Come on, I had to do it. In the first seven rounds, I only took two RBs, Ryan Grant in the second round and Jonathan Stewart in the fifth round. I don’t hate the idea of taking two or three RBs at the beginning of your draft this year. In fact, I have in several mocks I’ll be posting about soon. It just so happened that each time my pick came up in the expert league draft, I saw RBs who I expected to be available at my next pick that I was fine waiting to get. I never felt compelled to take a RB because there were always more. There are ALWAYS more this year! Did you hear that? Unfortunately, since this was an expert league, many of the other drafters also saw these RBs falling and snagged them before it was my chance. So much for catching fatty LenDale White where I wanted him. As a result of the running back by committee (RBBC) system and the high number of casualties at the RB position, there is a wealth of RBs in 2008 drafts. Once you get beyond the elite and a few more starters, there is quite a large plateau of talent that could at least operate in a rotation for your fantasy team. I probably would have taken more RBs early in this expert draft, but my average draft position (ADP) stats were all over the place compared to where many of the RBs were taken. Expert leagues operate a little off the norm. If you aren’t taking elite backs, I found better value in snagging elite and solid wide receivers and elite quarterbacks early in my draft. I’ll toy with my strategy a bit in the mocks I am doing this month, but I have to say, don’t sweat not talking RBs early. There’s plenty to go around this year.